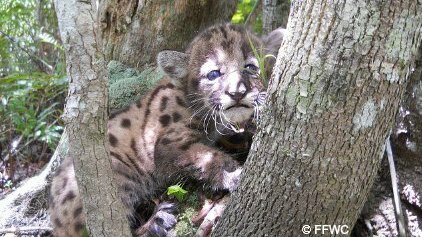 The Florida Panther, our State animal, is one of the most endangered species in America. It used to roam the woodlands and swamps all accross the southeast of the United States, but by the end of the 1800s, it had almost but dissapeared due to poaching and loss of habitat. Today, the number of Florida Panthers in the wild, confined to a much reduced range to the tip of southern Florida, is estimated at about 120-160 panthers. 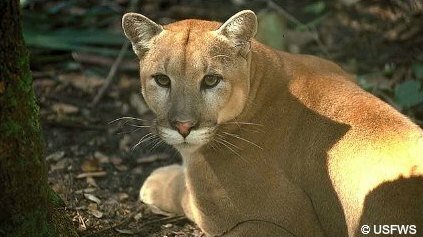 Almost on the brink of extinction, it wasn't until 1989 that the Florida Panther National Wildlife Refuge was established. The Refuge has been instrumental in protecting the ever-shrinking panther habitat that these animals need to survive. Not only has this been beneficial to the Florida Panther, it has also aided other endangered and threatened species like the Florida Black Bear and the Wood Stork. The Refuge is located within the heart of the Big Cypress Basin, and as many other Wildlife Refuges, it serves as a research and management facility. Although most of the Refuge lands are closed to the public there are two hiking trails accesible to visitors, a short 1/3 mile loop trail and a longer 1.3 mile trail. 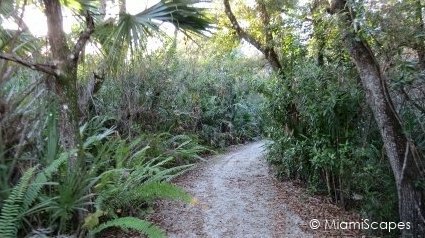 These are easy trails that give you a glimpse at the different panther habitats. You start on the short trail which later branches out to allow for the longer loop. Mid-way through the shorter loop there is a beautiful boardwalk/platform where you can stop and take it all in. That said, the chances of visitors seeing panthers in the wild at the Refuge are quite slim. Only between 5 to 11 Florida panthers roam the refuge. So why visit? More than anything, to gain an understanding for the plight of the Florida panther, and perhaps consider joining a program or volunteer to support the efforts of the Refuge. And this being the Everglades, you never know what you may encounter along the trails! Great time to visit the Refuge is on Save the Florida Panther Day, the third Saturday in March, when the Refuge celebrates its annual open house. Visitors have the chance to explore the Refuge through swamp buggy tours and guided walks and attend presentations and educational programs. All activities are free to the public. Check out this short video by the FFWCC on panther protection activities, including collaring a panther, monitoring panther behavior, as when female panthers are denning and producing a litter of kittens so they can be tagged and further monitored and releasing a panther after rehabilitation. Panthers are in constant threat from highway collisions and a shrinking habitat. Here's how you can help protect them! Slow Down on Florida's Roads! 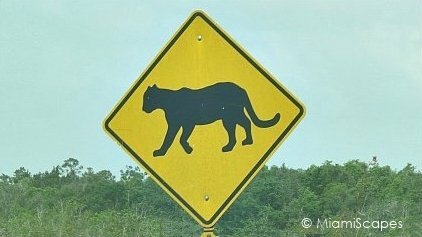 Collisions with vehicles is one of the leading causes of panther deaths. 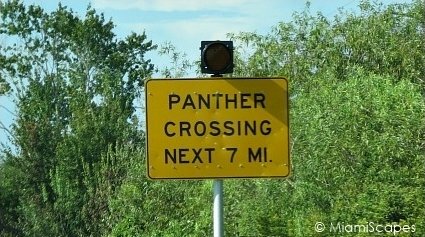 When you see this sign slow down and Give Panthers a Brake! You can help protect the Florida Panther by purchasing the Florida Panther License Plate. Fees from license plate sales are the primary funding source for the FWCs research and management of Florida panthers. Buy a Plate. 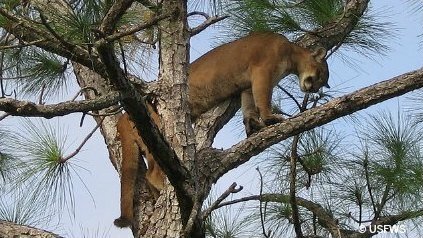 To report dead or injured panthers, call the FWCs Wildlife Alert Hotline at 888-404-FWCC (3922) or #FWC or *FWC on a cell phone. Make it a priority to protect additional panther habitat and travel corridors to give these beautiful big cats more room to roam. Write to your representatives! Where? : 20 miles east of Naples, on the northwest corner of the intersection of I-75 and State Road 29. 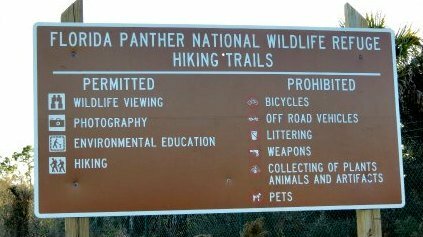 Not allowed: Pets, off-road vehicles, biking, weapons, collecting of plants, animals or any artifact from the refuge, and it goes without saying that feeding and disturbing wildlife are definite no no's. 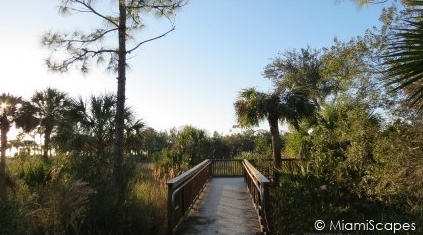 More Info: Official Site of the Florida Panther National Wildlife Refuge.